Get away to the lake at Rincon Gaucho, a charming 3-bedroom, 2-bathroom Livingston Manor vacation rental cabin. This homey 1,215-square-foot cabin offers plush furnishings and modern amenities for 5 guests to enjoy, including a private fire pit! Situated on 12 quiet acres, this cabin provides special access to Trojan Lake, less than a mile away and within walking distance of the property! Step inside and settle in for a relaxing retreat. Wood interior siding and rustic decor create a cozy cabin atmosphere throughout the open living space. As you enter the living room, a brick fireplace with a wood mantle serves as a charming center piece. Feel free to sit back on 1 of 2 comfortable sofas to catch up with family and friends. Prepare delicious home-cooked meals with ease in the fully equipped kitchen, featuring stainless steel appliances, a 2-person breakfast bar and adjacent dining table with seating for 8! Refresh after days at the lake in 1 of 2 pristine full bathrooms, then retreat to 1 of 3 cozy bedrooms for rest and rejuvenation. The bedrooms are equipped with plush queen or twin-sized mattresses, with fresh sheets and comfortable bedding. You can look forward to roasting marshmallows under the stars gathered around the fire pit, and the convenience of being just a short walk to Trojan Lake! 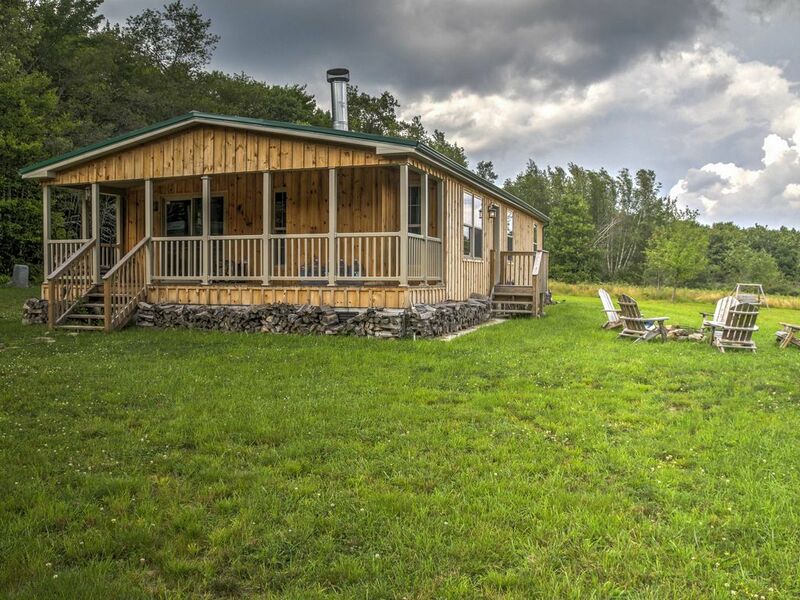 From this scenic Livingston Manor Cabin, the main town is just 3 miles away, making it easy to shop, dine and run necessary errands for days spent on the lake! Stock up on seasonal organic vegetables, fresh eggs, charcuterie and smoked trout at the Main Street Farm Market and Cafe. Enjoy a cold beer at Catskill Brewery, or stop into Brandenburg Bakery for a sweet treat. Nearby restaurants offer hearty dishes, cold beverages and something for everyone. Spend days fly fishing on the surrounding rivers, boating on lakes or hiking through scenic nature trails around town! Whatever adventure you choose, this property is sure to provide a memorable trip to the New York forests. - Ideal Livingston Manor location - A private cabin in a quiet area, just a short walk to Trojan Lake and a short drive to Main Street shops, restaurants, and the farmers market! The Cabin was absolutely beautiful and featured all the desired modern amenities to make our rainy weekend there comfortable. Town is right around the corner for supplies and has a handful of restaurants / diners to choose grab a bite at if you don't want to cook. The beds are comfy and plentiful, and the cabin is spacious and wonderfully decorated. When we arrived the place was a bit hot, and the AC took until the next day to really cool the place down. Luckily it was a nice weekend and we were good opening up a few windows. The propane in the grill was empty, but we were able to use the stove to make our meal inside. I'm not sure if there was a refill around the property somewhere, as we didn't ask, but if you're hoping to grill just ask beforehand - the property contact was very responsive and eager to help. I'm confident they'll make sure you have what you need for your stay. It was a nice cabin that was well kept. Everything was as described in the rental listing. Not much else to say. I enjoyed the place and I would stay there again. Beautiful, clean and spacious. We loved everything about this lovely cabin. It was very comfortable, clean and secluded. A short drive to town, where we bought from the local organic market and cooked at the house while enjoying the scenery. We did not have any issues. Thank you to Mary and Pablo, we will definitely try to be back in the summer. We loved how isolated this home is but still close enough to the local town. The house has everything you need, even games for the kids to play. There is WiFi but its rather slow since its satellite but you don’t need WiFi to enjoy the beautiful night sky and all the stars you will see. My girls, who are all under 6 years old, looked forwarded every night to “moon gazing” and “star gazing”. I believe we may stay here again in the summer. this is a lovely getaway cabin. The manager Mary was very helpful, and the owner actually text me to see if we needed anything. I woud deffinatly rent this cabin again. Stayed on a snowy weekend with two friends. Perfect getaway home to unplug and retreat for the weekend. Mary was easy to communicate with and very nice. Listing description was accurate. I would stay here again without a doubt.